You never know what you’re gonna’ find when you take the back roads! Last summer heading South from New England down Interstate 81 there was a terrific traffic back-up in Southern Virginia. 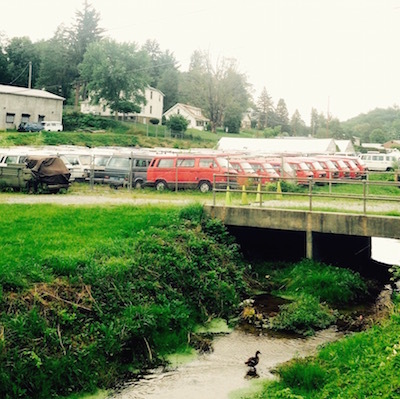 After several hours I was finally able to exit and found myself on Highway 11 where I came upon this VANAGON COLLECTION in the town of Pulaski. I’m not sure if you could buy one or not? It didn’t seem to me like a junkyard but a carefully arranged Art Exhibit of sorts with all the red one’s in the front. Just the week before my friend Jeanne had brought her VANAGON to a gig for me to check it out. Growing up my family didn’t do the camping thing but I was intrigued by RV’s…not fancy one’s but hippie VW’s and such. 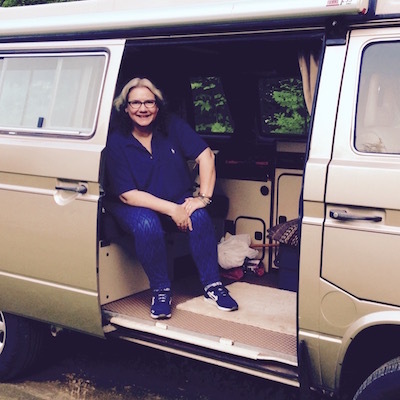 Now I’m thinking my next touring vehicle may need to be a VANAGON!